Rick comes to see Judith painting with Michonne on the porch in Alexandria. They head out to the field and watch birds in the sky together. Jesus, Daryl, Tara, Eugene and the others radio to one another to check in and meet up. Rick and Michonne come into the city on horseback, taking out a couple of walkers along the way. The entire gang meets up in what appears to be the outside steps of an abandoned museum. They quietly make their way in, killing a few walkers. They head up a large wide staircase and into a dark room filled with furniture draped with cloths. Siddiq’s leg is grabbed by a walker. He falls and sees the walker with spiders coming out of its eyes. He freaks out. They all help him. He hates spiders. Daryl and a young girl come across a canoe. She recalls a memory of her and her brother fighting at a county fair. She gets sad. Daryl tells her he used to fight with his brother too, and his friends who he also lost. Jadis brings Rick into a room where she knows there are seeds. They grab them with excitement. It is part of their plans to grow more food. Together with more than a dozen of them help pull a wagon down the large staircase and across the glass floor that begins to crack. They move slowly in order to make it across with the rest of their goods, but the glass breaks quickly and Ezekiel goes down through the floor. He is tied around the waist. They work to pull him up and through the floor as walkers swarm close to him down below. They finally pull him up. Carol kisses him when he is safely back on his feet. He kisses her back. They smile. On their way back home, Ezekiel asks Carol to marry him as they ride side by side on horses. She tells him to put the ring away. She smiles to herself. They all come to a broken down bridge. They decide to split up. Some of them will go to the Hill Top while the others will go to the Sanctuary or Alexandria. They try to pill the wagon through the mud. It is stuck. The noise alerts more than three dozen walkers. They decide to run and leave the wagon. A young teen named Ken won’t leave the horse. He goes to free her and gets bit. They work to help him. He dies quickly. Maggie sobs. The others go quietly. That night, Maggie tells Ken’s parents about his death. His mother is angry. What a waste, all for a plow. Her husband tries to calm her. She tells Maggie she voted for her but maybe Gregory is the one who should lead. Maggie got her boy killed. And her son doesn’t have a father either. Maggie apologizes. They hold Ken’s funeral. His parents watch on as one of them sings. Maggie stands up on the porches in the dark with her son where no one can see her. Rick, Daryl, and Michonne show up to see Eugene, and the rest of the community at the sanctuary to check in on their progress. 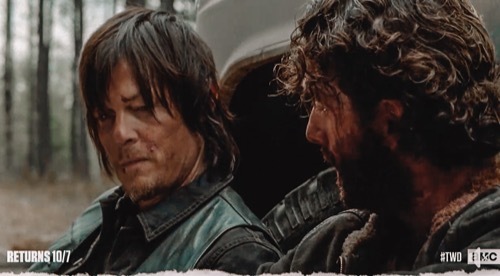 Eugene wants to talk to them about a few things but Daryl tells him he needs to wait they just lost someone. Michonne spots some graffiti that says “Saviors save us” on one of the walls. She asks Daryl why. He shares that it has been happening here and there since the crops began dying. Rick tells the people that he found heirloom seeds, a plow and more for them so they can fix their crops. Daryl pulls Rick aside. He doesn’t want to lead the sanctuary anymore. He wants to be out there or with the others. It was better when it was just them. Now all of them are scattered in different communities. He wants to go to Hill Top to see Maggie and the baby. Rick tells him that things have changed. Daryl corrects him – he has changed things. Rick warns him that someone will take his place. Daryl doesn’t seem to mind. Carol comes to see Daryl outside. They talk about how they cannot sleep and Ezekiel. Daryl thinks he is corny but a good guy. He is happy for her. Carol tells Daryl she wants to take over for him. She wants to lead. Ezekiel asked her to marry him. She hasn’t told him her plans for the sanctuary. Gregory and Ken’s dad share a drink. Ken’s dad wants to see justify served for his boy dying. They discuss Maggie and how both of them think she needs to be punished. She shouldn’t be the leader. Rick washes up before he gets into bed with Michonne. They hold each other and talk about the day and losing Ken. They talk about Negan. Did they make the right decision? Not killing him? Michonne thinks they need to set some ground rules and agreements of civility between the communities. Rick talks about Daryl being unhappy. Michonne thinks they need to do something about it if he is unhappy. They talk about rebuilding the bridge. Maggie runs into Gregory. They talk about the rough day and then Gregory tells her someone defaced Glenn’s grave. She heads to check it out in the dark. Someone jumps her. She fights back. Enid hears and comes running. The man in a hood pushes her back. She hits her head and gets knocked out. Two others come to help. The hooded man is ken’s dad. Maggie goes to confront Gregory, who denies it all until she makes him mad. He tells her he built this place. They fight and Maggie stabs him. Carol tells Ezekiel she will see him soon. She tells him her friends need her help. He will move at her speed for now. She asks Jerry to look over the king. They say goodbye. Rick, Michonne and Daryl show up at Hill Top. Maggie comes out and tells them what happened. Rick holds baby Hershel as he and Maggie talk. She cannot visit him because of Negan. She doesn’t want to talk about it so they talk about fixing the bridge. Maggie asks her to be generous. She will give food to the sanctuary if they do most of the bridge work. She also wants some of their fuel. Rick tries to talk to her but she isn’t willing to give in. She is going to lead now like they talked about. Later, after the sun goes down they all gather to watch Gregory be hanged. She announces that the punishment must fit the crime. Some of the kids have gotten out of bed. Michonne yells but it is too late. Gregory’s feet are taken out from under him. He goes down. Maggie yells the kids need to be brought back to bed. Rick and Michonne wince at the situation.